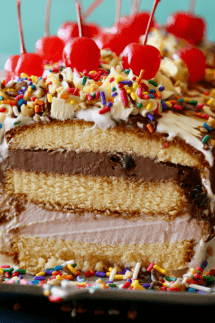 This No Bake Ice Cream Cake has layers of pound cake, your favorite ice cream flavors and is covered by yummy cool whip! Add your favorite toppings, like hot fudge, sprinkles and whipped cream and you will have a delicious dessert ready in no time! Forget spending hours in the kitchen this summer. With this No Bake Ice Cream Cake you will have a delicious dessert that is refreshing and ready in no time! Hey folks, it’s Jackie from TheSeasideBaker.com back again with another fun and simple recipe. I don’t know about your neck of the woods, but around here it is getting hot! Just the thought of standing around in my itty bitty kitchen with the oven on makes me sweat, so we are now focusing on No-Bake Desserts. More specifically, ice cream desserts! (Be sure to also check out Princess Pinky Girl’s No Bake Ice Cream Sandwich Cake – this is always a favorite with her family and I cannot wait to give it a try too! 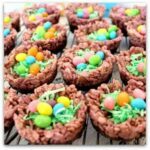 Looking for another great no bake dessert? We love this No Bake Oreo Cream Pie! 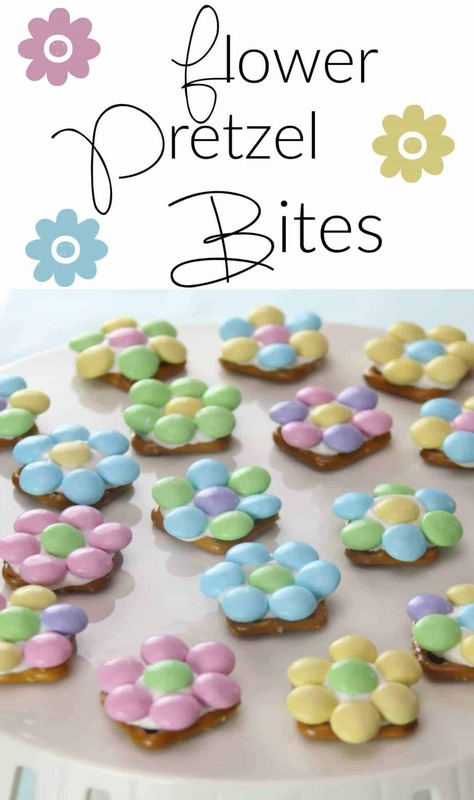 It is super easy to make and only 5 ingredients! While a decadent slice of chocolate cake is perfect on most days, when it is close to 90 degrees outside I crave something light and cold like ice cream! You can pretty much use any type of ice cream for this recipe. We used Strawberry and Chocolate Fudge Brownie. Our ice cream choices are always divided in our family of five, which is why we always seem to end up with Neapolitan to make everyone happy. The strawberry and chocolate ice cream flavors combined with the buttery pound cake layers certainly did not disappoint! The ice cream sundae toppings were the “icing on the cake.” They were fun, colorful, and of course delicious. I mean who doesn’t love thick chocolate hot fudge and sprinkles!?! 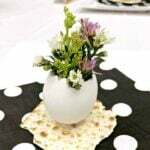 This recipe is so easy that even kids can make it. Simply slice the pound cake in 3 pieces horizontally and let them go to town adding the ice cream and toppings. Then, use this opportunity to teach your kids about cleaning up (I can almost guarantee you don’t want to be picking up all of those sprinkles on the floor). Bam, not only do you have happy kids, a fun dessert, but you have also turned it into a life lesson. Triple win! 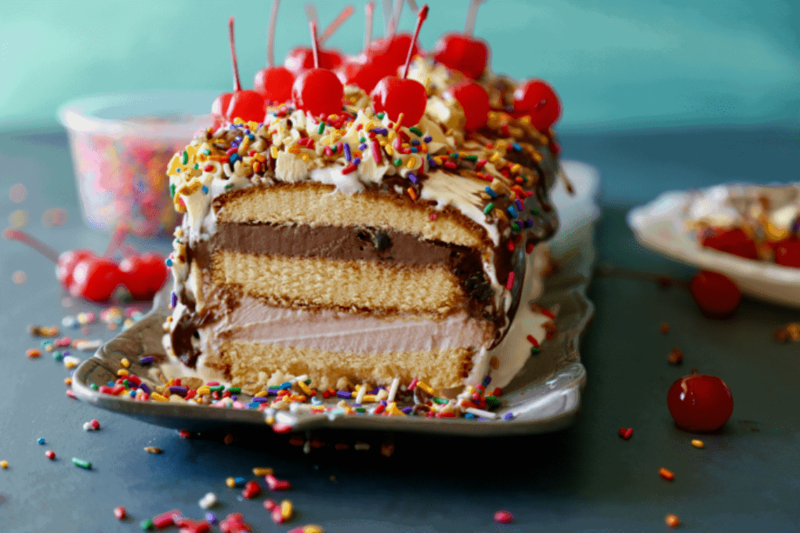 This No-Bake Ice Cream Cake is the perfect dessert to serve at your next party, or just a fun way to finish off the evening with the family. With no cooking time, and simple ready made ingredients, this slice-and-serve cake will be a hit for kids and adults alike! For more no bake desserts check out my Homemade Drumsticks, Dulce de Leche Milkshakes, and No-Bake Raspberry Cheesecake. Enjoy! Line the inside of the pan with plastic wrap, and place first piece inside the bottom of the pan. 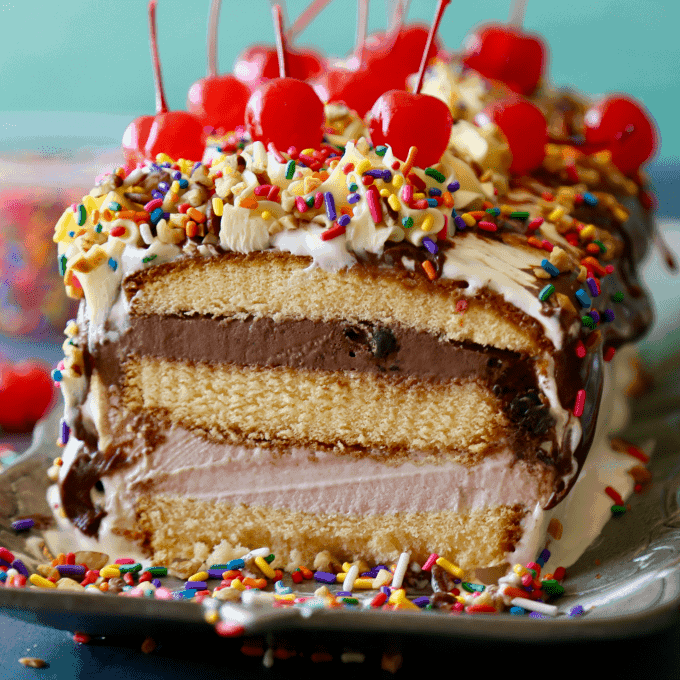 Layer pound cake with 1 pint of softened ice cream, then top with next pound cake layer. Smooth second pint of ice cream over pound cake layer, then top with final cake layer. Freeze for 1 hour. Once frozen, remove cake from pan and place on serving dish. "Frost" cake with cool whip, then freeze for 1 hour or overnight. About an hour before serving, carefully spread hot fudge sauce (not heated) over cake. 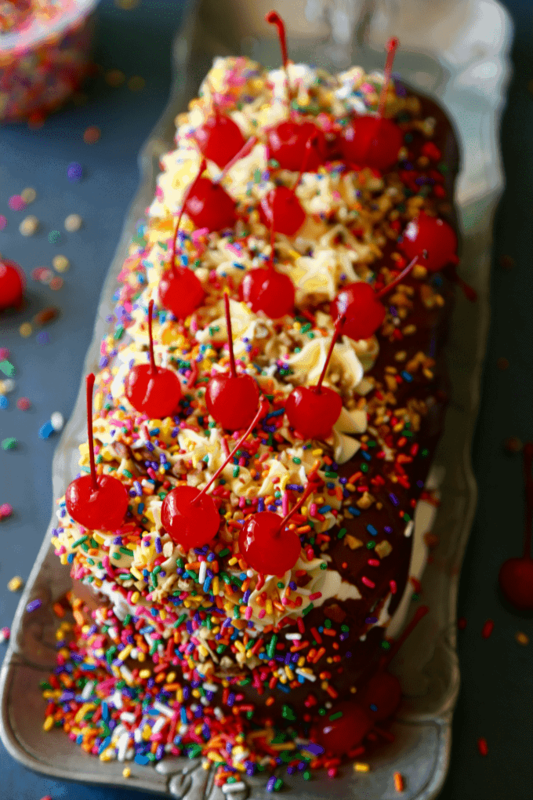 Top with dollops of whipped cream, chopped nuts, maraschino cherries, and sprinkles. Freeze until ready to serve. When ready, slice and serve immediately! 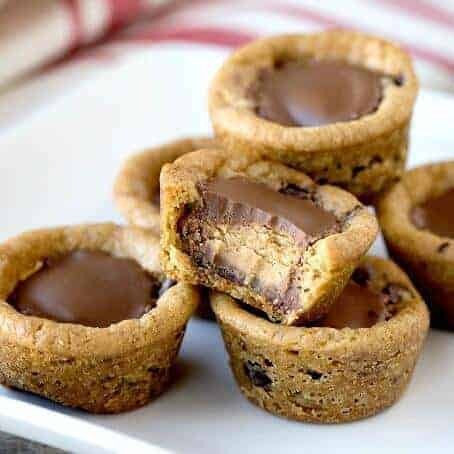 Here are some other great NO BAKE DESSERTS to try out!